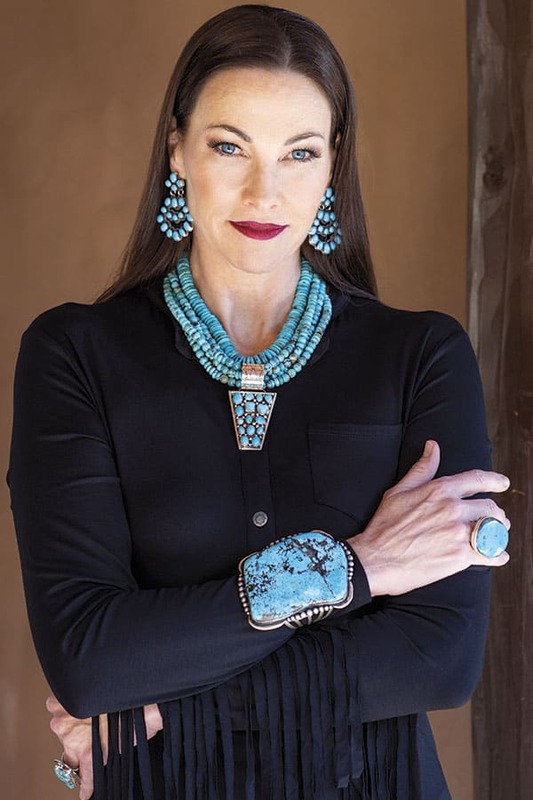 Turquoise is arguably the "Diamond of the West," and when handcrafted by some of the world's most talented artists, they are truly Santa Fe's greatest treasure. Sterling silver Kingman turquoise earrings by Wayne Aguilar,$165, sterling silver Pilot Mountain turquoise (unknown artist) private collection from Joseph Lonewolf, $25,995, sterling silver Blue Gem turquoise left cuff & ring set by Randy Smith, $6,500; Sterling silver Kingman turquoise cuff by Wayne Aguilar, $1,195, shirt by Giangi Napoli, $280, all from Malouf on the Plaza, maloufontheplaza.com, 505-983-9241. All photos by Ken Amorosano. 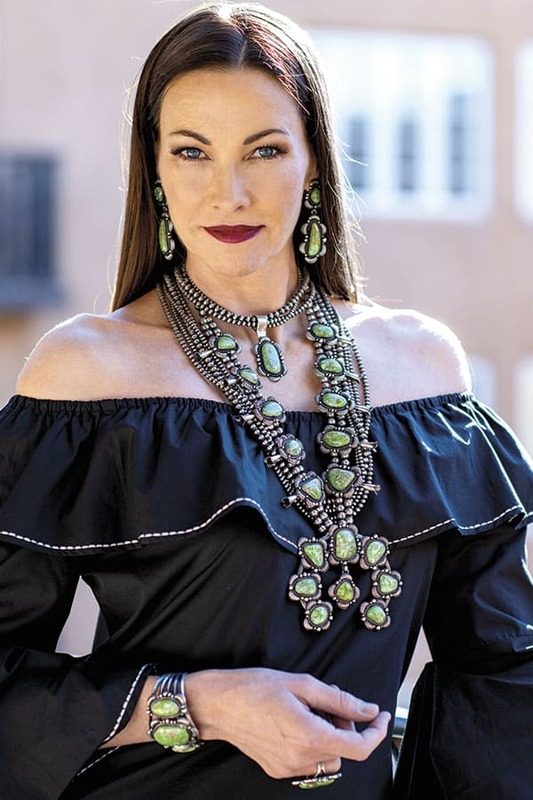 Turquoise is arguably the “Diamond of the West,” and when set in vintage silver or handcrafted by some of the world’s most talented artists, they are truly Santa Fe’s greatest treasure. Royston turquoise earrings, $795; Bird’s Eye squash blossom necklace by Leon Martinez, $27,500; right hand: Bird’s Eye turquoise cuff by Leone Martinez, $7,128; Royston turquoise ring by R.R.B., $1,140, left hand: Royston turquoise cuff by R. Bennett, $4,200; Carico Lake turquoise ring, $1,695; all from Samsville Gallery, samsvillegallery.com, 505-216-7777; shirt by Express, $59.90, express.com. Sterling silver & coral earrings by Jackson, $320, small stone coral inlay necklace, $499, medium stone coral inlay necklace, $672, sterling silver cross necklace with leather by Buffalo, $620, Italian coral beaded necklace, $495, vintage coral squash blossom necklaces, $4,200, right hand: ring with coral inlay, $216, oval coral ring, $159, sterling silver cuff by Buffalo, $225, coral tennis bracelet, $216, sterling silver concho bracelet with coral by Marie Yazzi, $350, left hand: exclusive special stone ring, $258, large coral ring, $225, small band ring with coral, $59, onyx inlaid sterling silver cuff, 295, sterling silver cuff with coral, $795, narrow sterling silver cuff with onyx stones, $250, all available from Peyote Bird Designs, peyotebird.com, 505-986-4900; cross fox wrap, $2,300, Coyote Couture, coyotecouturecolorado.com. Red coral naja earrings, $485, red 4-strand necklace (doubled up), $575, red coral cross pendant, $970, red coral cuff, $675 ea., velvet wrap custom designed by Rocki Gorman, $675, all available from Rocki Gorman, rockigorman.com, 505-983-7833. Sterling silver & Kingman turquoise earrings by Kevin Randall Sterling, $640, Sterling silver Royston & Turquoise Mountain squash blossom necklace by Mathew Charley, $17,995, sterling silver Kings Manassa turquoise ring by Robert Leekya, $1,695, shirt by Lafayette 148, $398, all available from Malouf on the Plaza, maloufontheplaza.com, 505-983-9241. 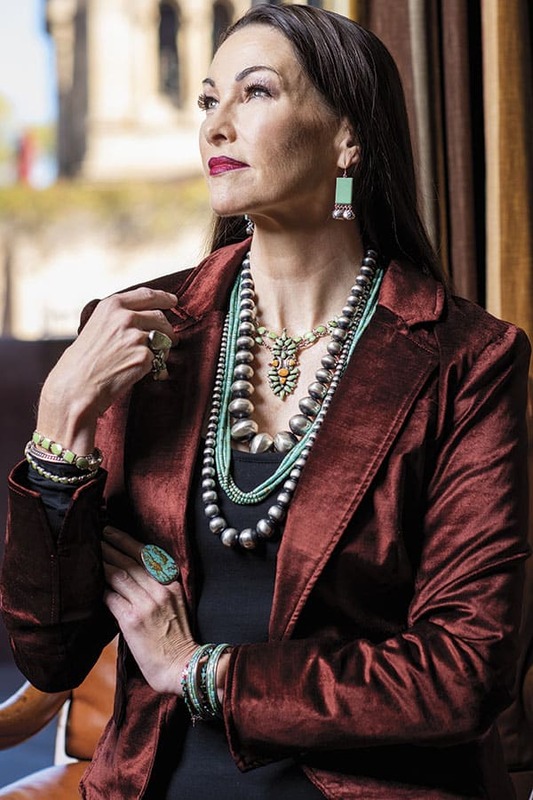 Turquoise earrings, $450, reversible green necklace, $762, green turquoise and coral necklace by Jeannie Vicenti, $2,950, large graduated desert pearls by Kyle Lee Anderson, $2,200, 4 strand beaded turquoise and coral necklace, $900, long graduated desert pearls by Jock Favour, $825, right hand: teardrop Kingman turquoise ring, $225, multi-stone green turquoise ring, $99, medium green turquoise tennis bracelet, $504, sterling silver cuff by Karl Natanni, $520, small green turquoise tennis bracelet, $280, left hand: Kingman turquoise ring, $595, turquoise mosaic bangles, $495 ea., small beaded turquoise bracelets, $68 ea., all from Peyote Bird Designs, peyotebirddesigns.com; velvet jacket by Free People, $148, freepeople.com. 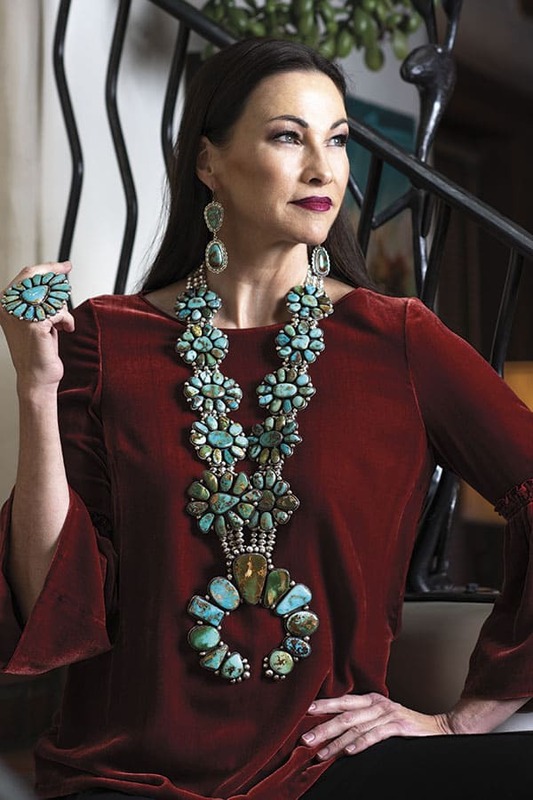 Kingman turquoise chandelier earrings, $660, Kingman turquoise short single disc necklace, $375, Royal Beauty turquoise short 4 strand necklace, $675, Kingman turquoise pointless pendant, $875, Kingman turquoise cuff, $3,550, Kingman turquoise ring, $290, dress by Tasha Polizzi, $135, all from Rocki Gorman, rockigorman.com, 505-983-7833. Sleeping Beauty turquoise earrings by Dillion, $295, reversible turquoise and onyx tennis necklace, $717, Sleeping Beauty turquoise pendant necklace, $109, Sleeping Beauty turquoise beaded necklace with 14k gold, $5,400, vintage turquoise squash blossom necklace, $3,800, left hand: turquoise oval ring, $159, sterling silver ring with turquoise and labradorite, $225, turquoise cuff by Joe Eby, $650, concho and leather bracelet by Rick Montano, $125, right hand: Turquoise bangles, $225 ea., Sleeping Beauty turquoise tennis bracelet, $459, beaded bracelet by Chili Rose, $295, all from Peyote Bird Designs, peyotebird.com; dress by Lulu’s, $60, lulus.com. Carico Lake turquoise earrings, pendant with Navajo pearls, cuff, and ring, all by Kirk Smith, price upon request, 5-strand Navajo pearl beaded necklace, $3,960, all from Samsville Gallery, samsvillegallery.com, 505-216-7777; dress by Union of Angels, $114, unionofangels.com.